This Jungle Gem Crystal Glaze - Floral Fantasy - transforms in the kiln when small pieces of glass burst into color and intricate patterns during the firing process. Use alone for stunning effects, in glaze combination blending with Stroke & Coats®, or simply as an accent to your design. Fired finish will be textured. Not recommended for dinnerware due to surface characteristics. Crystal glazes were designed to mature at cone 06/05. Apply to shelf cone 04 bisque. Shake the jar well and stir during the application process. Apply 3 coats with a fan brush, allow to dry between coats. Avoid placing crystals towards the bottom of ware to keep them from flowing onto the kiln shelf during firing. Crystal Glazes can be fired to higher temperatures. Review individual color label for cone 6 firing results. The crystals in the glaze will melt when fired, which may create a textured surface. As that surface may be difficult to properly clean if in contact with food, we recommend crystal glazes to be used on decorative ware only. Container Size - Wide mouth pint: 16 oz. We recommend a soft fan brush, such as CB-604 #4 or CB-618 #8 Soft Fan, for glaze application. Stir frequently as crystals tend to settle in the jar due to their weight. Store upside down with the lid on securely to allow easy mixing and even dispersion of crystals. As crystals tend to flow at higher temperatures, we recommend limiting the number of crystals on bottom third of vertical piece to avoid glaze running onto kiln shelf. Re-distribution of crystals may be required during the final coat. Where you see the crystal is where you will see it bloom. Follow the instructions provided on the bottle. Mid-range color results are defined on the label. 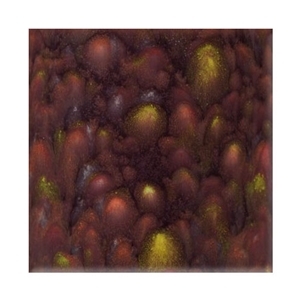 Test tiles are recommended to see how this glaze interacts with your chosen clay body. PLEASE NOTE: Jungle Gems ™ Glazes are certified AP nontoxic, with the exception of CG 707 Woodland Fantasy and CG 713 Peacock Green which requires a caution label, CL Health Caution, due to soluble copper. Please refer to label for specific information. For mid-range firing results, please click here to view Mayco's Mid-Range Firing Guide. 1 All product information has been supplied by the manufacturer - Mayco Colors. For more information, please visit Mayco Colors. Hugo Pottery Clay - 25 lbs.